This week, we're looking at one of the world's most popular red varietals, Shiraz. Ah, Shiraz, the red grape that seems to be planted just about everywhere. From the smoky red of Australia, to the fruit-forward Shirazes of Califronia, to the intensely earthy and structured Syrah/Grenache blends of the Cotes du Rhone in France, there seem to be few wineries who don't produce at least some form of Shiraz. 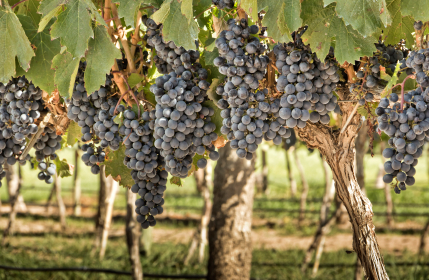 As a grape, Shiraz is relatively easy to work with -- it ripens early, is resistant to mildew and rot, and can be used to produce a variety of wines. As a wine, Shiraz tends to have high tannin content and intense flavours and aromas, particularly of blackberries and dark chocolate. Many Shiraz wines from California have 'jammy' notes and are intensely fruity. Conversely, in the Cotes du Rhone, it is usually blended with Grenache and Mourvedre to make 'GSM' wine. Shiraz also has a lengthy history 'down under', serving as one of Australia's oldest and most popular grape varietals. Australian Shirazes tend to be medium-bodied with hints of both fruit and pepper and a nice touch of tannin. They can also be intensely smoky or, like Californian reds, 'jammy'. Conversely, 'GSM' wines from the Cotes du Rhone in France tend to be full-bodied with rich but smooth tannins. In terms of food pairings, Shiraz tends to pair well with red meats, pastas with tomato sauce (such as pasta arrabiata), and chili con carne. Shirazes from Australia or California also pair well with some spicier dishes, such as chicken vindaloo, lamb madras, Thai beef curry, or spicy chutney. Names: Shiraz, Syrah, Antourenein Noir, Candive, Marsanne Noir. Flavour Profile (Old World): Earthy, full-bodied, with rich, smooth tannins.